Our ten days of holiday parties is ending with a huge bang. We are planning on staying up till the cows come home (whenever that is since we don’t live on a farm). We’re headed to dinner with friends at Kokkarri and then to a fabulous party. What are you plans? 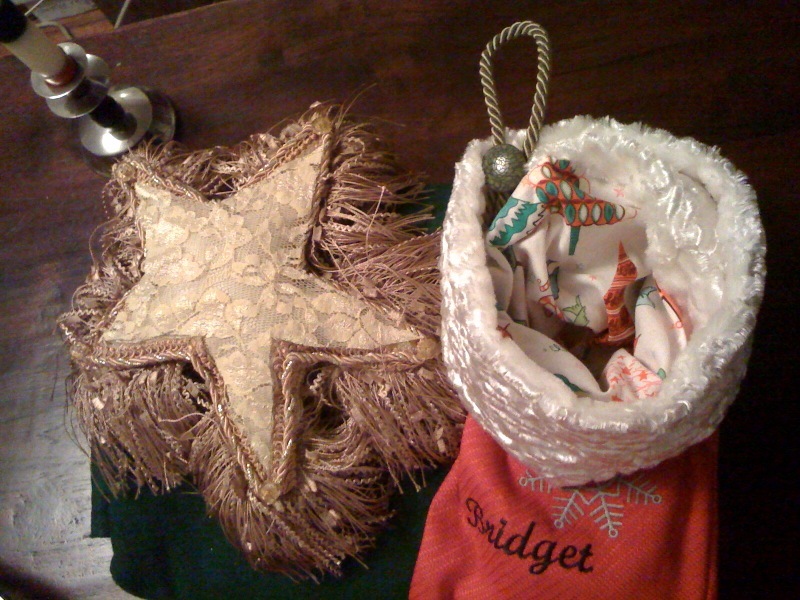 Whatever they may be, I hope you have a sparkling New Year’s eve and I’ll see you back here in 2011. One thing I love about this week is that it allows time for reflection on the past year. What a year it has been for me! 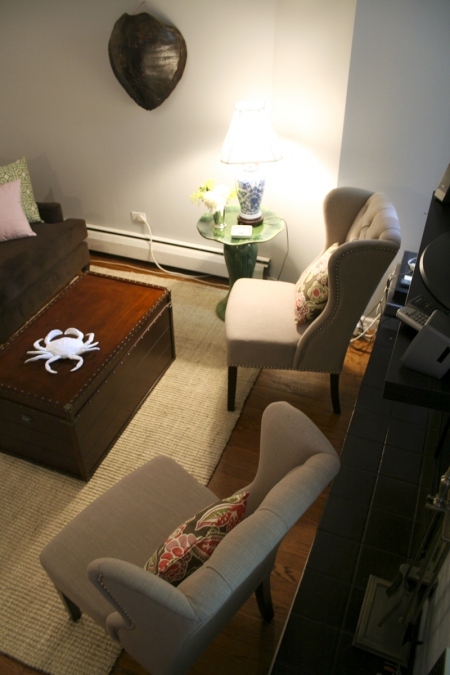 It’s easy for my mind to get tangled in fearful thoughts as I venture into the new land of interior decorating. Sometimes I find it hard just to keep my head above water. However, as I reflect back on this year, I see that I’ve actually accomplished a lot more than I ever would have thought. This is a resolution I’ve actually kept and that alone is accomplishing something. 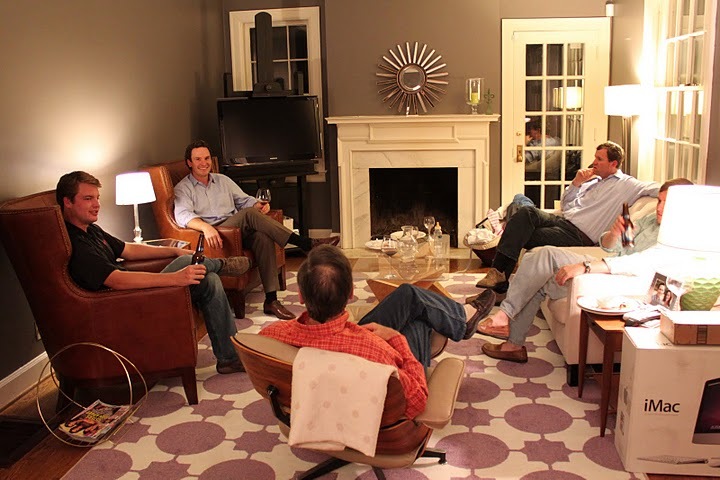 The blog has brought me incredible nourishment and fervor for creativity. 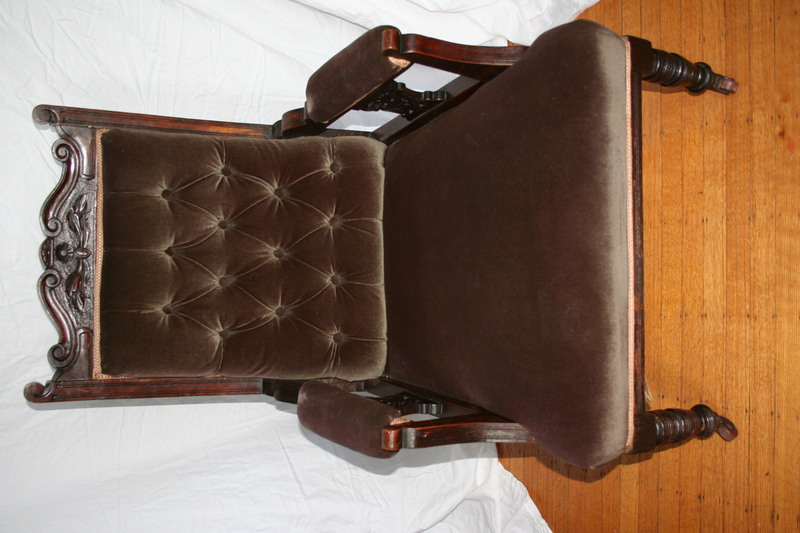 The chair that sparked it all! 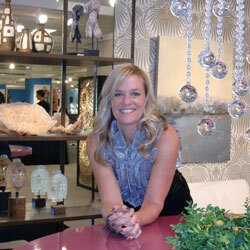 which I sold to this amazing talented woman: Julia Buckingham Edelmann of Buckingham Interiors + Design. And a friendship sparked. 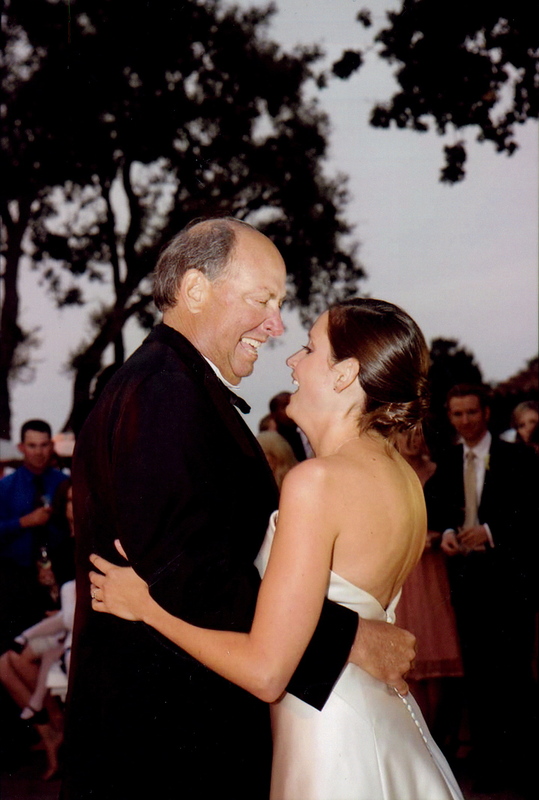 Julia encouraged my dreams and helped me to feel confident in the career path choices I was making. With her sage advice, I felt like I could take on a client. I am also taking classes in interior design and I’m grasping as much knowledge as I possibly can. I’ve met the most amazing bloggers and designers and I’m constantly in awe of the design community. My cup runneth over this year. We shall see what 2011 brings, but I’m thinking more growth and change and that is what I’m looking forward to the most! There is no way that I would be here without you! When I feel its hard to keep my head above water, it is my readers that keep me afloat. Thank you for reading! You mean the world to me! Happy New Year! 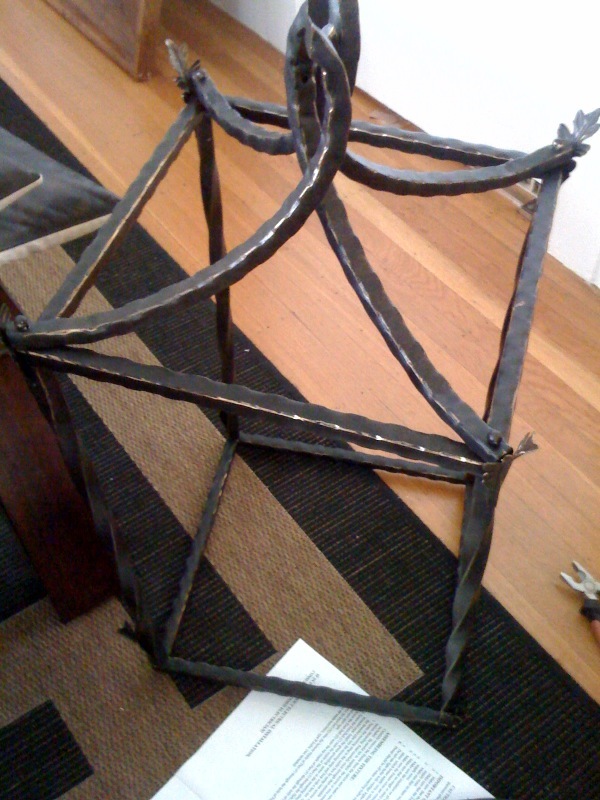 Now, you can see my new cage light in action. What do you think? It’s larger than life but I like how it’s oversized for the room. 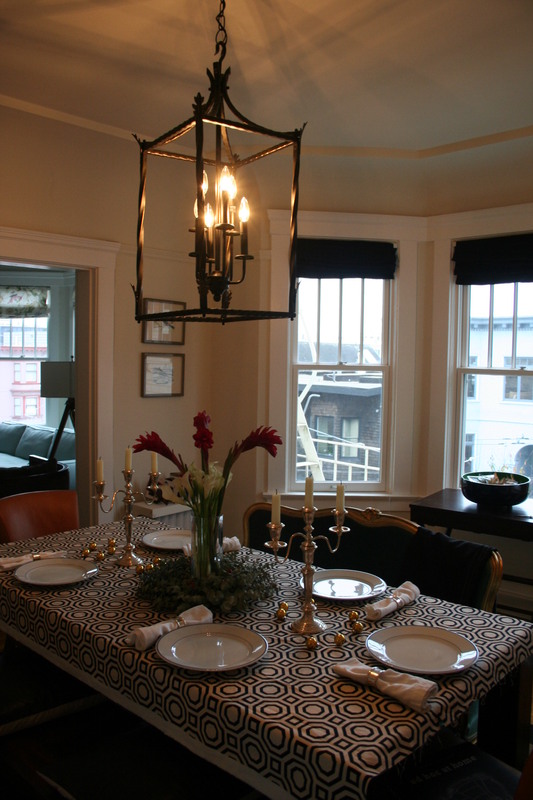 There is nothing like lighting to take center stage in a room. 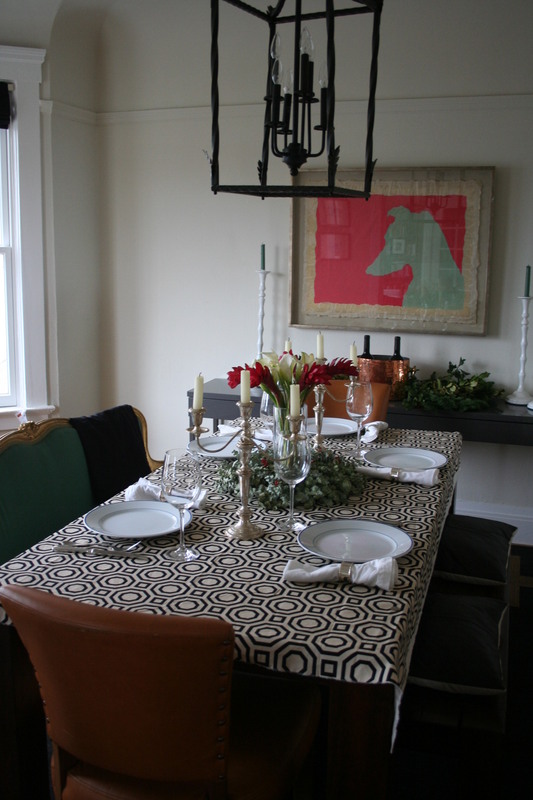 I changed my tablescape as well because we had another dinner party last night. 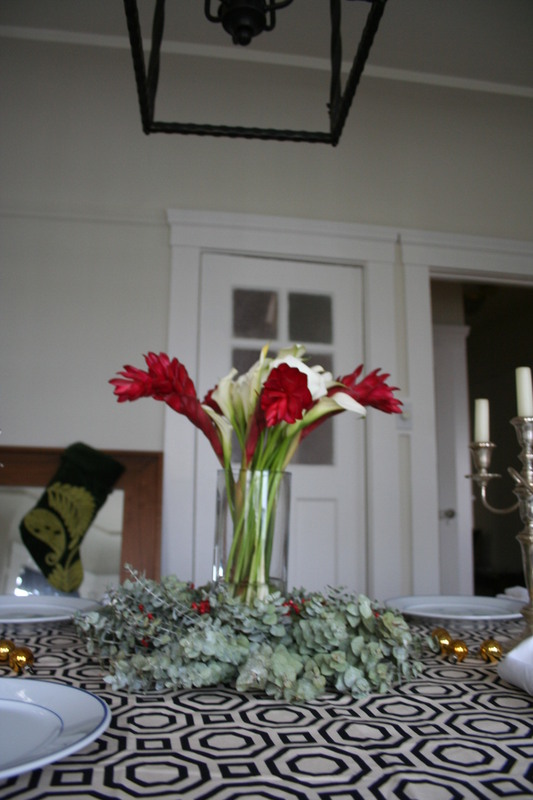 I used the eucalyptus wreath from Trader Joes that has been hanging on our front door to frame out the flowers. 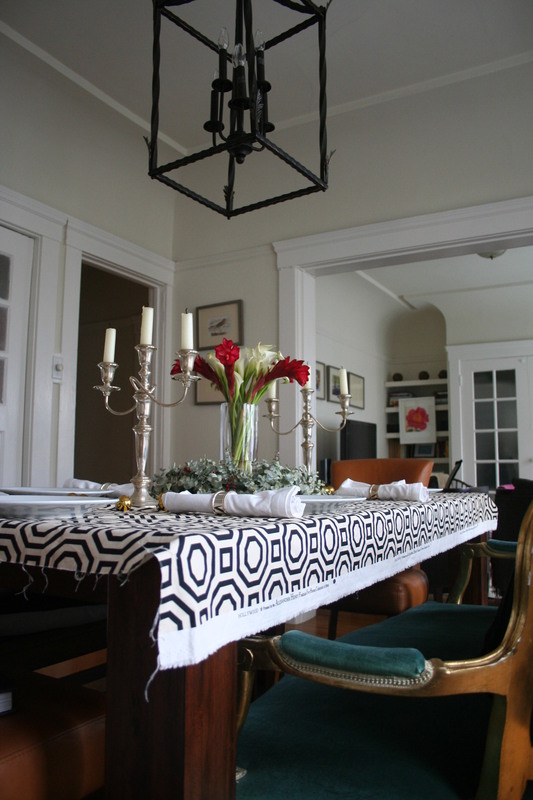 The fabric was tucked under the table for the dinner party so they didn’t have to see the unsightly tattered ends. 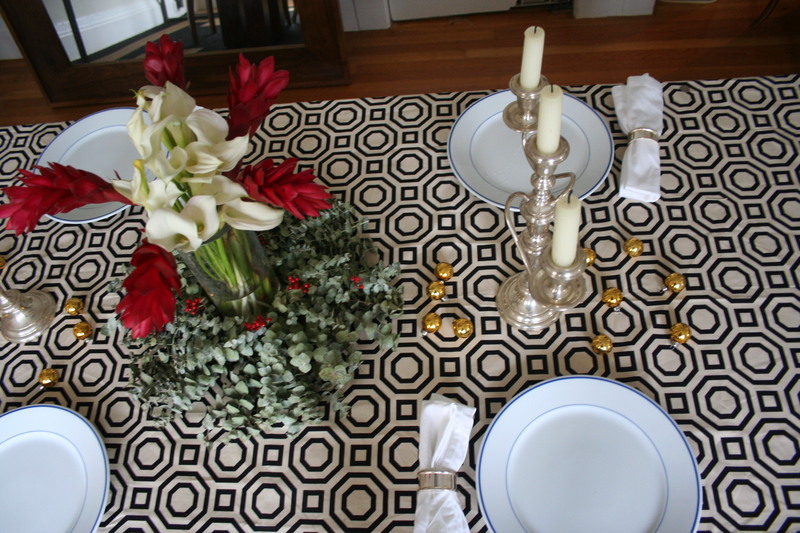 It was tough to get a good picture since it was gloomy gray day but you get the idea for my dinner party tablescape. 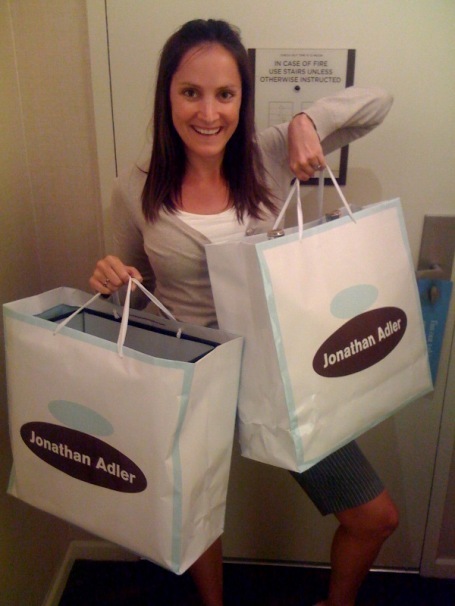 I drove down to the South Bay yesterday afternoon for a client meeting and along the way I stopped by my mom’s place to finally pick up our wedding china. 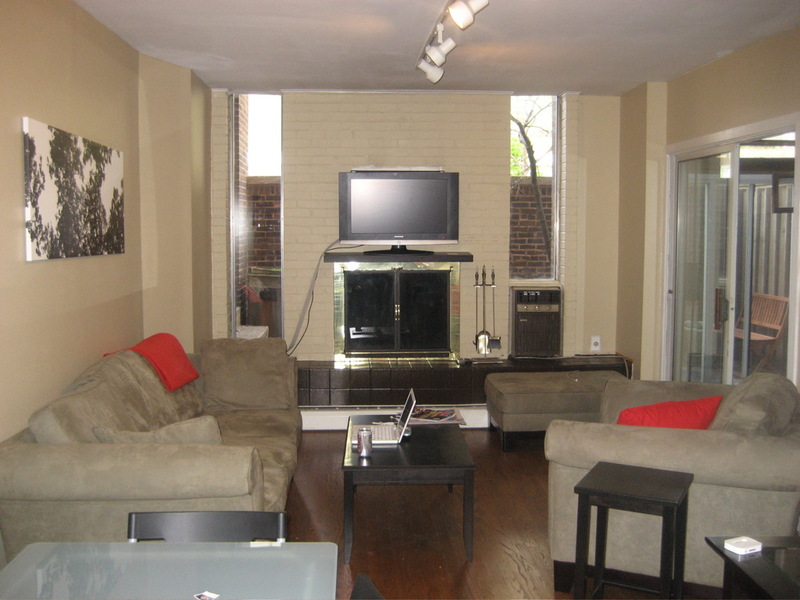 I’m so happy to finally have it at our apartment – I love it! If you’re thinking to yourself, where is my invite to dinner? I promise, it’s coming! 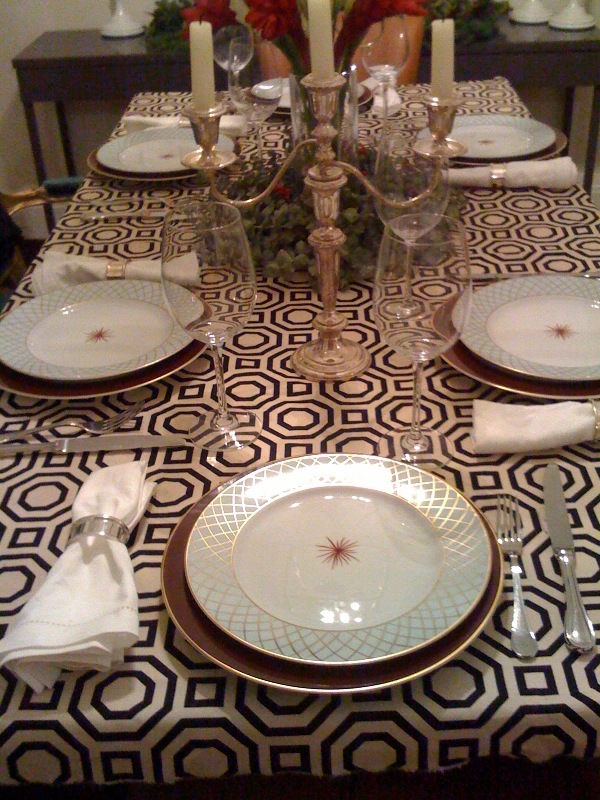 Let the dinner parties begin!! 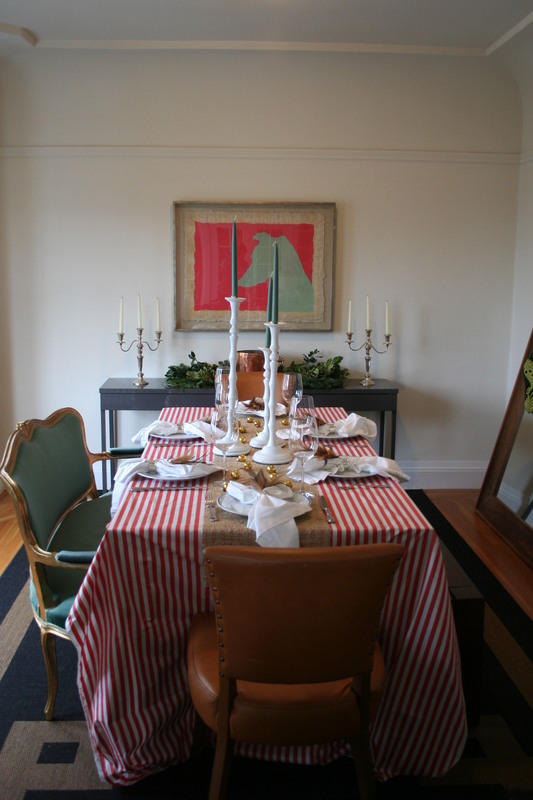 Tis the season for them – we have attended or hosted a dinner party every night since Dec. 23 and it will continue to be nightly until Jan. 1st. Love it! 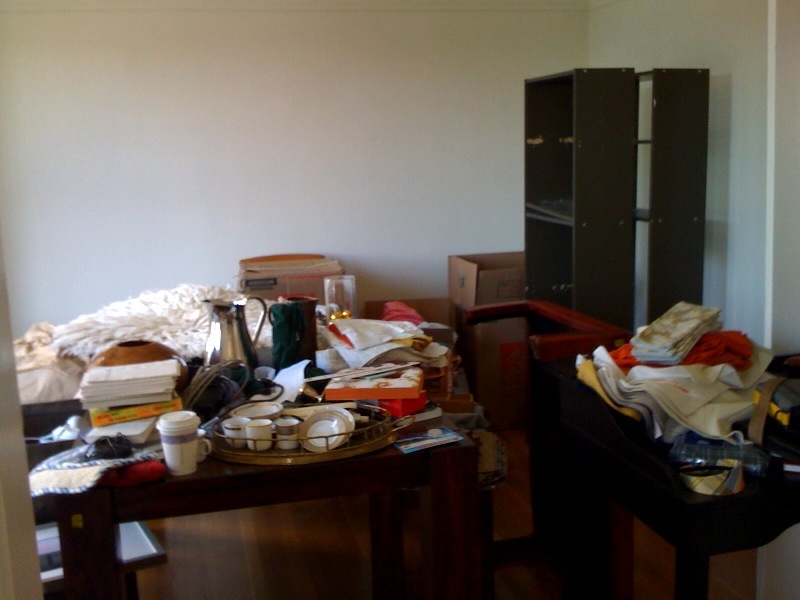 I was so happy to have Graham’s help around our apartment this weekend. 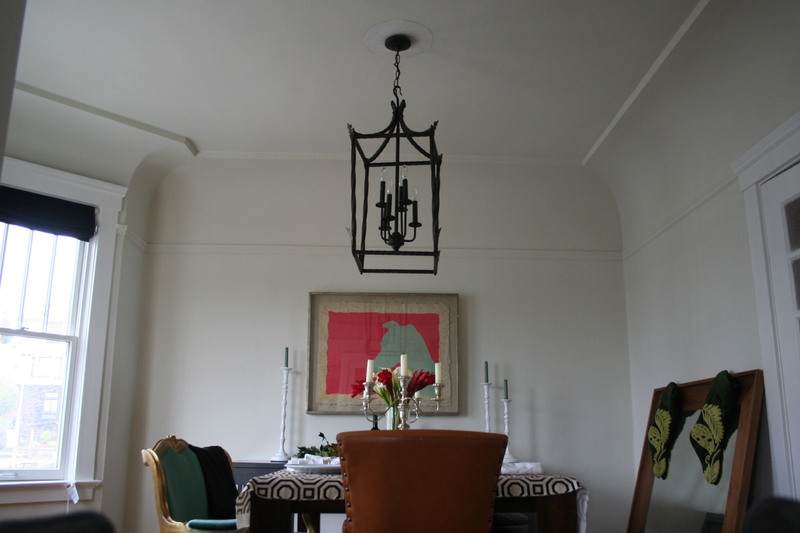 We were finally able to switch out a light in our dining room. 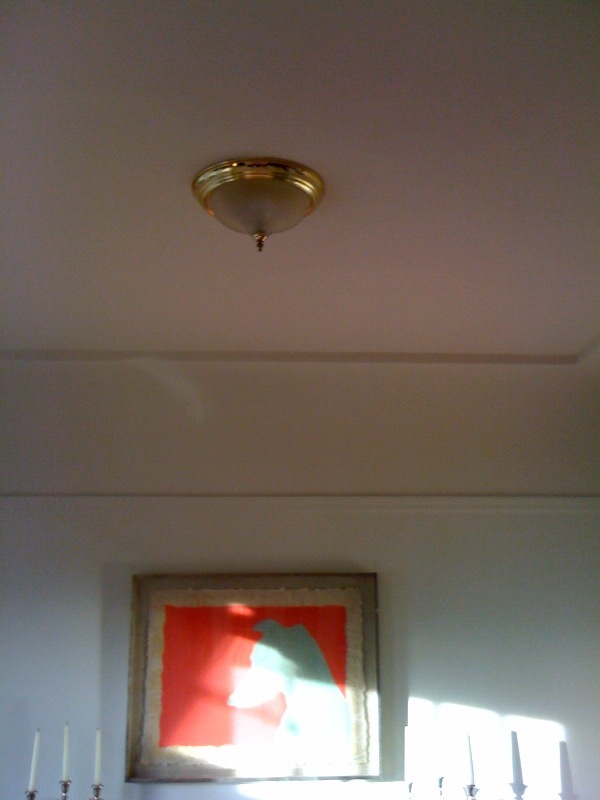 This flush mount light needed to go. 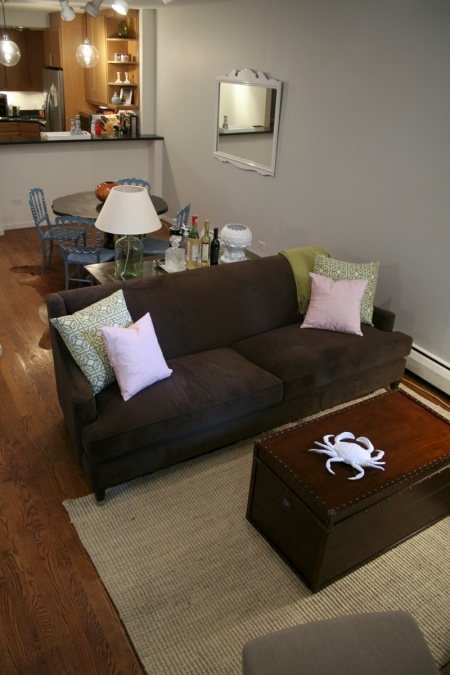 I love the end result and I’ll be sharing more pictures from farther back (so you get a better perspective) tomorrow. 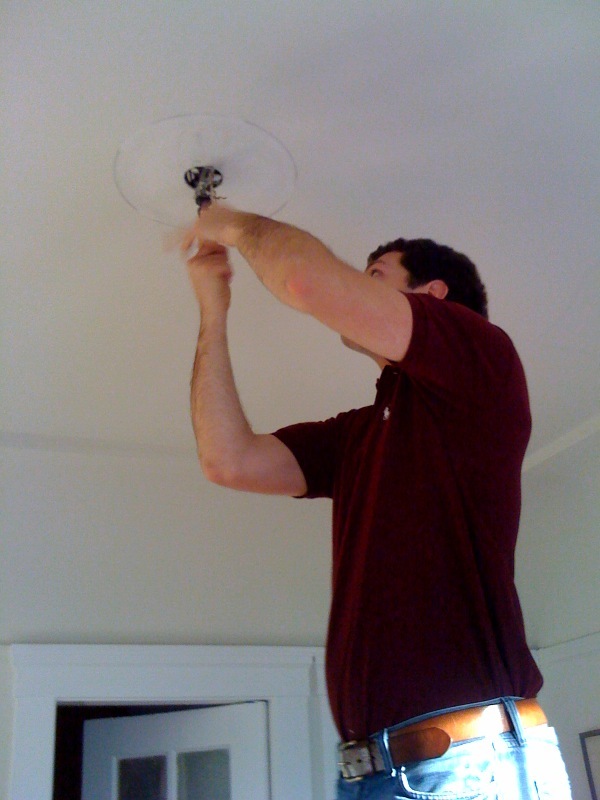 Thanks to my electrician husband. I hope you had the most wonderful holiday weekend. We had an amazing time with family and friends and I’m a little bummed it’s all over with. At least New Year’s is not far off! 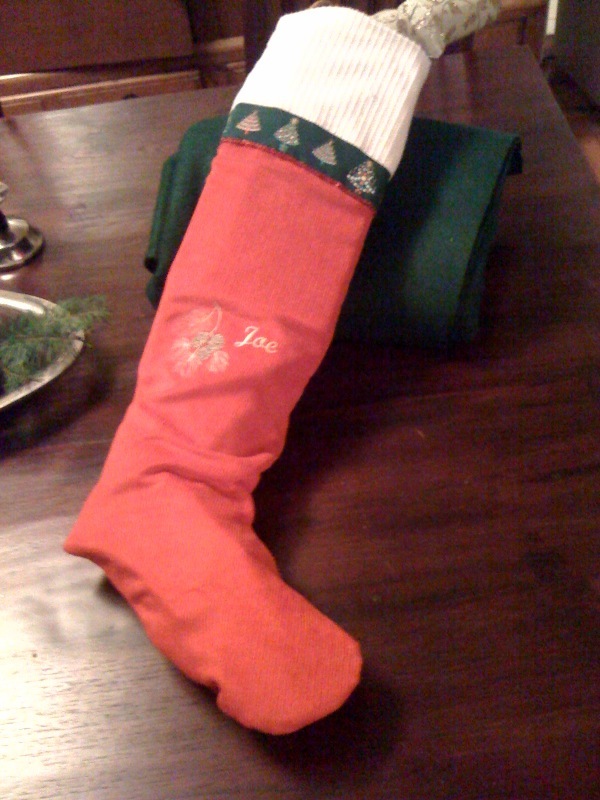 Today, I wanted to share with you stockings that my sister-in-law handmade. She is an amazing seamstress, incredibly fashionable and very creative. She is the woman behind the children’s clothing line: Frances Reid Clothing, which I will be blogging about more fully once her site is up and running. 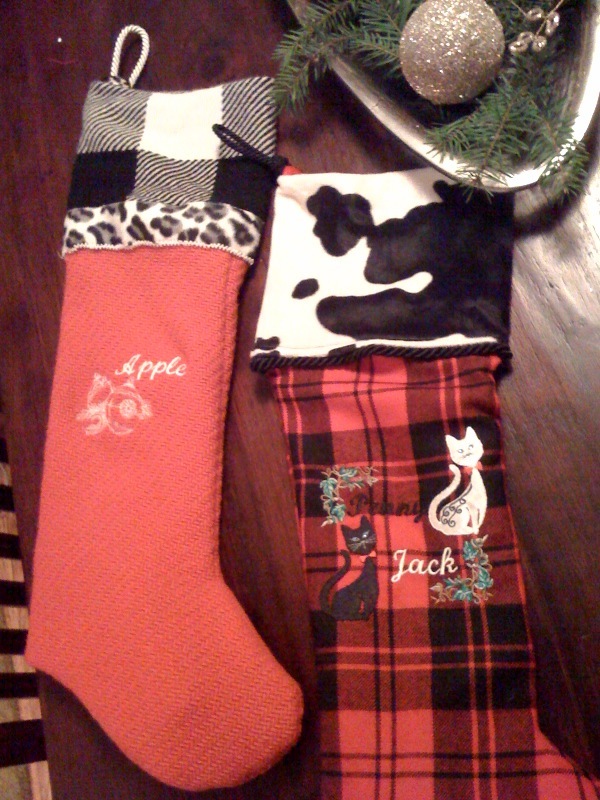 Here are the stockings she whipped up for her husband, herself and their cats and dog. 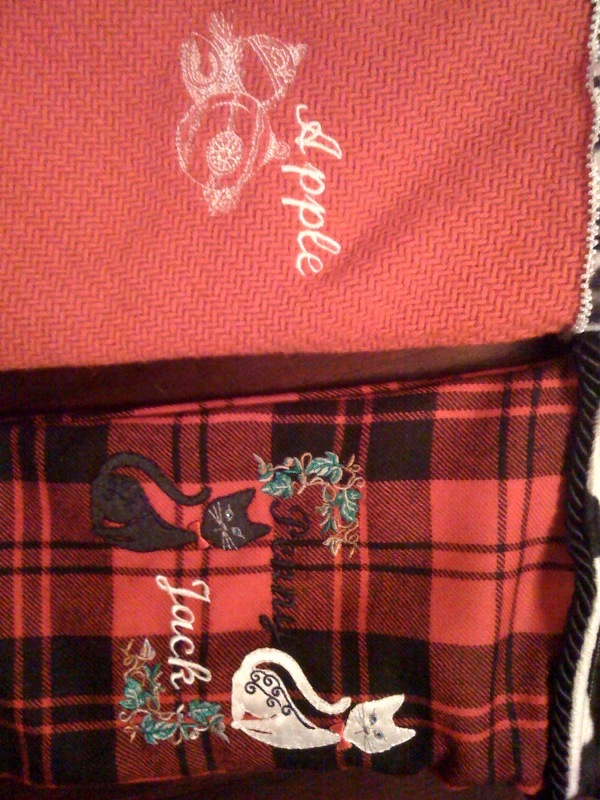 Stockings for their cats: Apple, Penny and Jack. 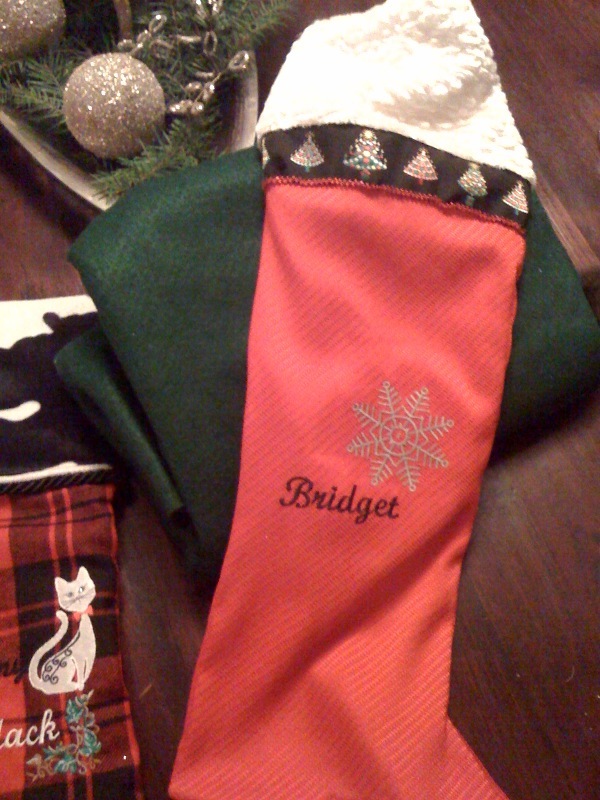 She even lined the inside with a different coordinating fabric for each stocking. 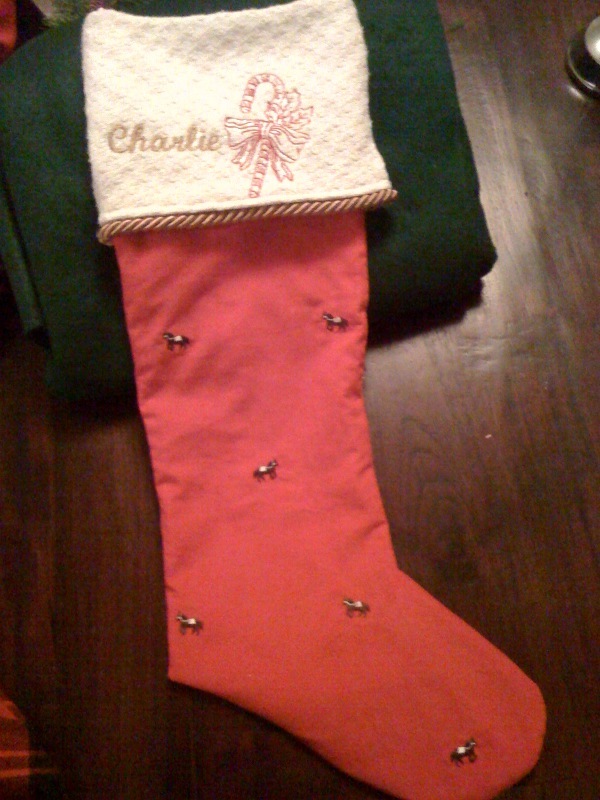 My favorite – the stocking for their dog, Charlie. 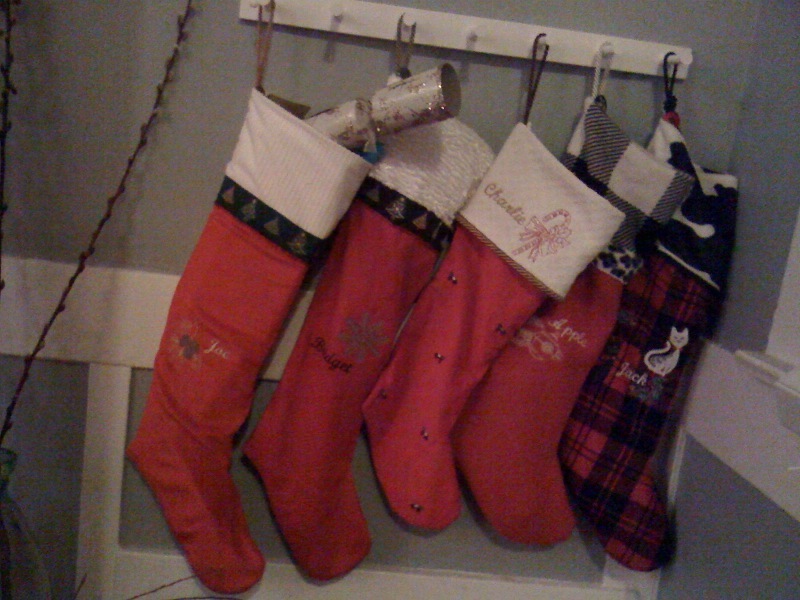 Without a fireplace mantel to hang the stockings, Bridget pulled an ingenious move and hung them on their coat rack. 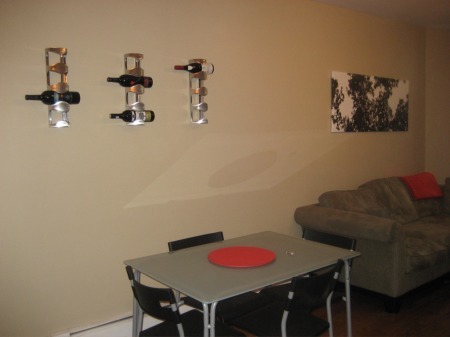 So smart and creative! Well done, Bridget!! 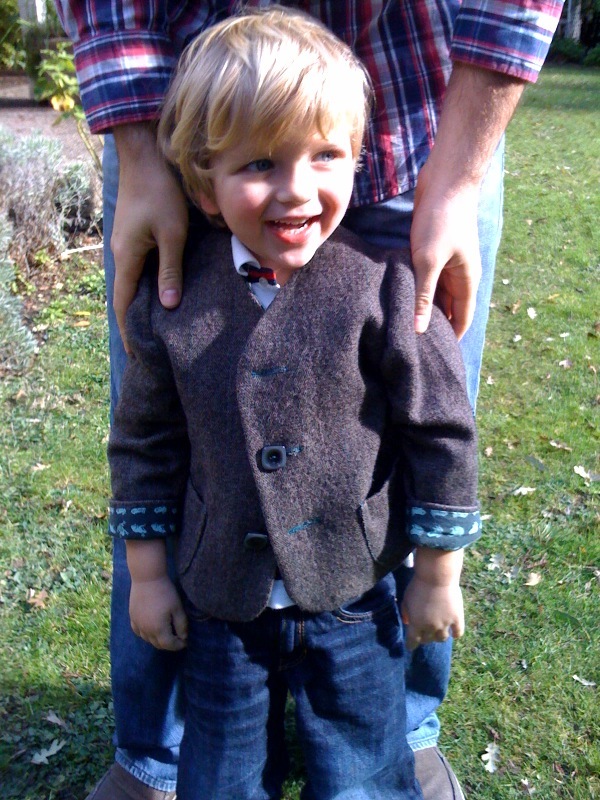 The lining is the most adorable frog lining that matches the stitching and coloring of the jacket – it is an awesome, one of a kind jacket that he looks very dapper in. I wish you all a very merry Christmas! I hope your weekend is blessed, brimming with happiness and your cheeks hurt from smiling too much. Sending you all my love on this fabulous Christmas eve! I must say, I’m thrilled with how it turned out. 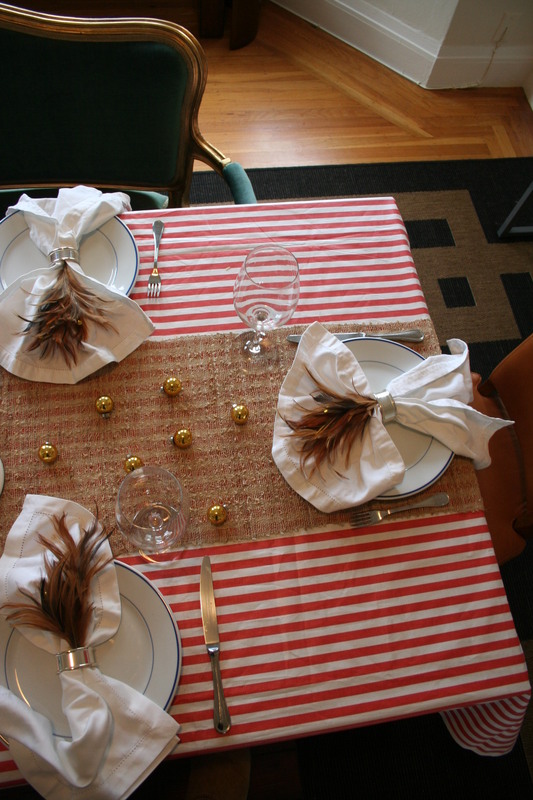 I used a vintage orangey, red and white striped fabric that was going to be used for a client’s room; I got 5 yards off of e-bay for $35. 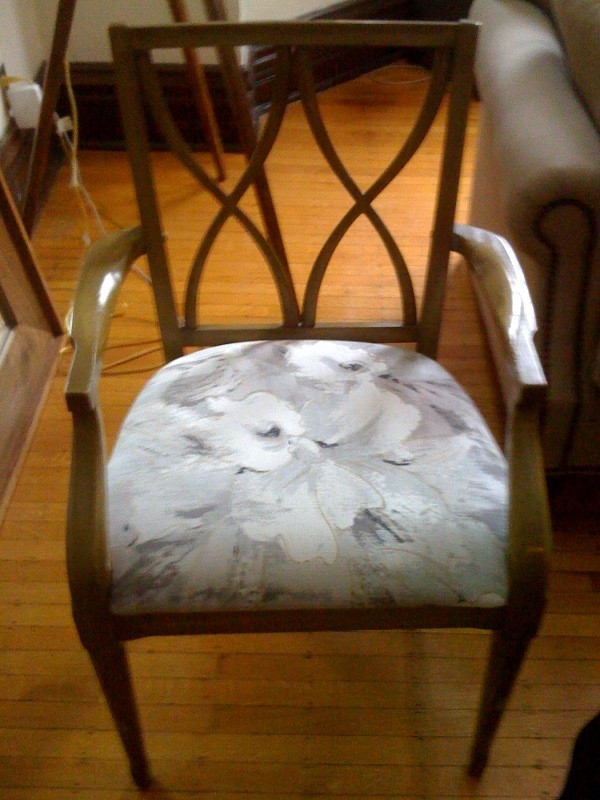 We decided to go for a slightly different direction in my client’s room and so the fabric was going to go unused. I figured it must come out and spruce up our table. The feathers, I got from JoAnne’s for $0.50 each and all the rest is mine. 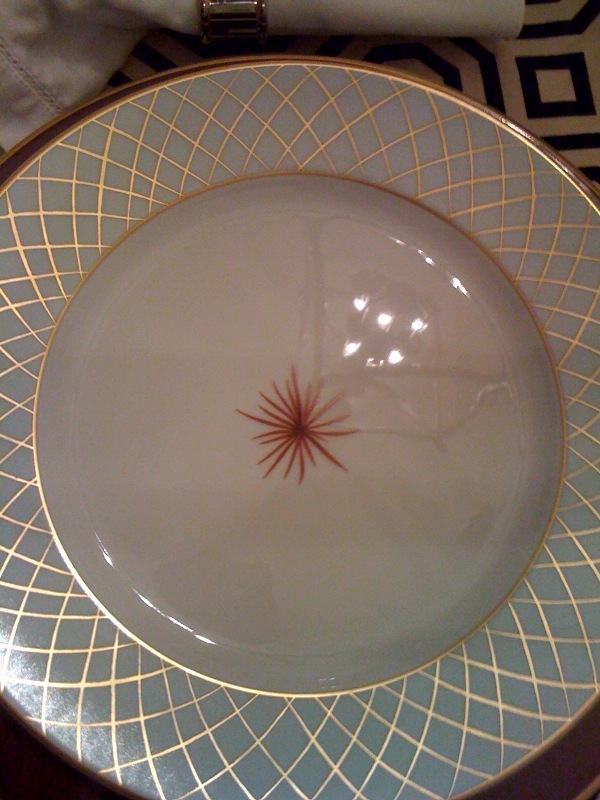 The plates are our every day plates from Pottery Barn – I love them! 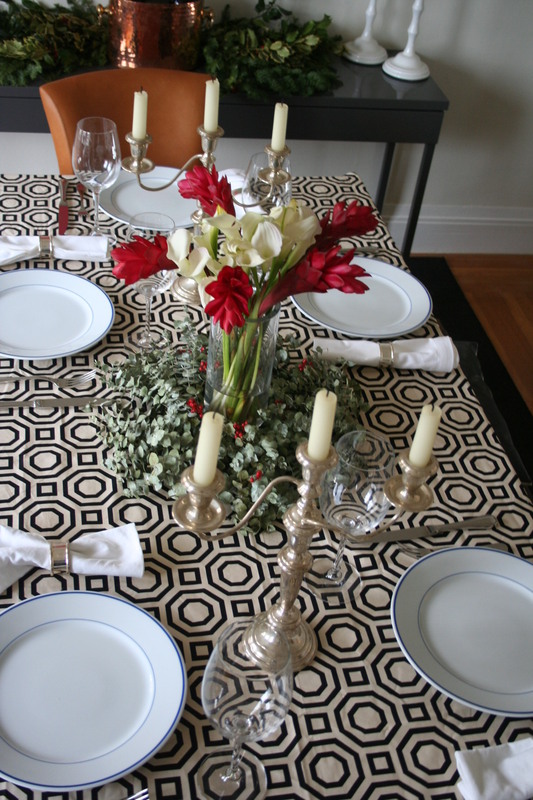 The white napkins, silver napkin rings, table runner, gold balls and wine glasses are Pottery Barn. Can you tell I once worked there? 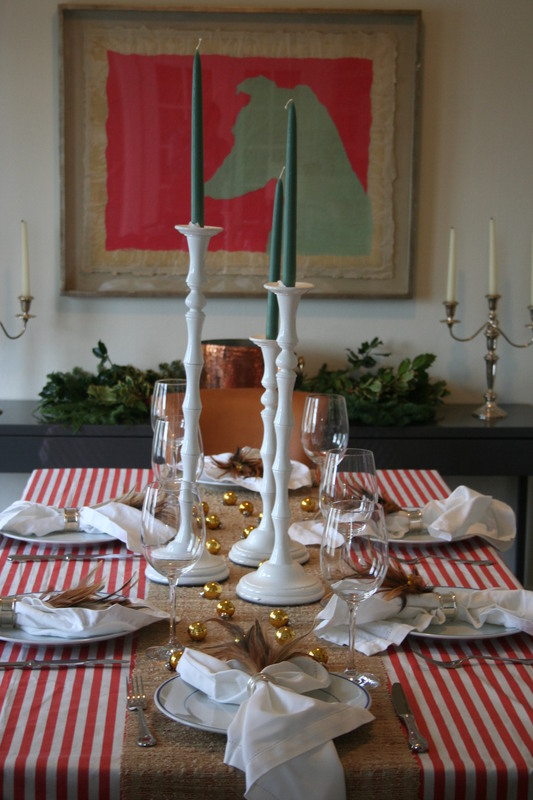 The gorgeous tall white candlesticks were a wedding gift from Gumps. 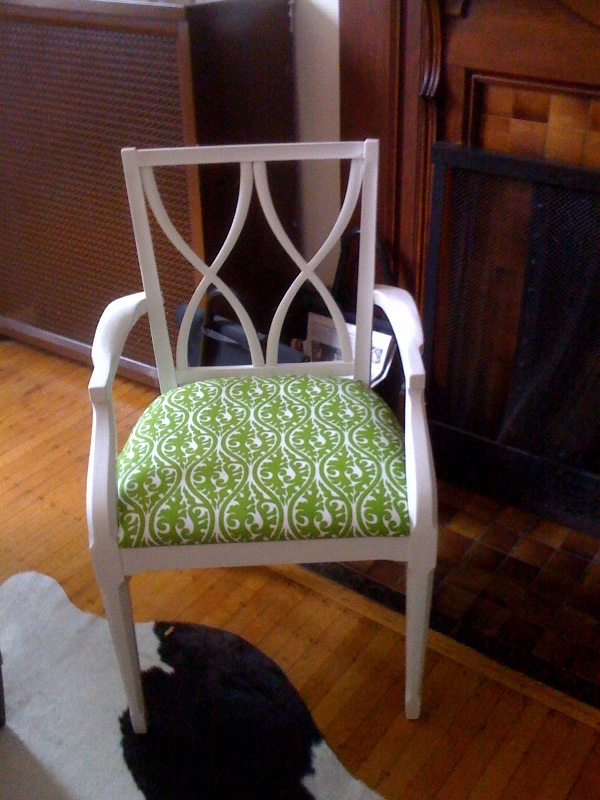 The green settee, I bought off of Craigslist earlier this year. 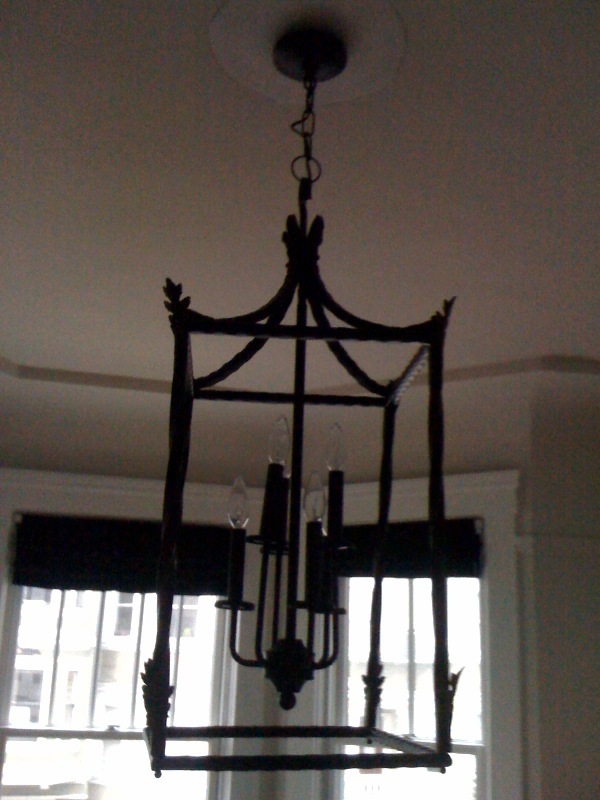 It used to reside in our living room and now usually sits under the bay window in our dining room. 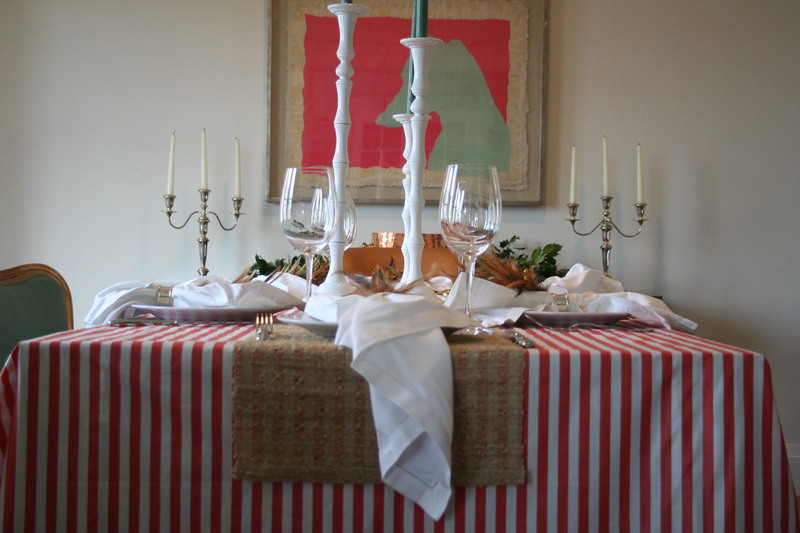 But for Christmas that baby has got to take center stage at the dining room table. 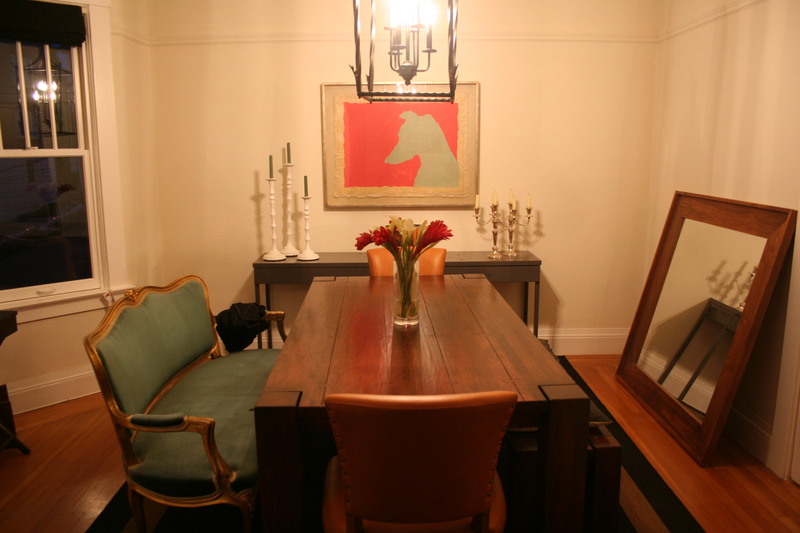 The console table is from Ikea and then greenery was from Trader Joes. 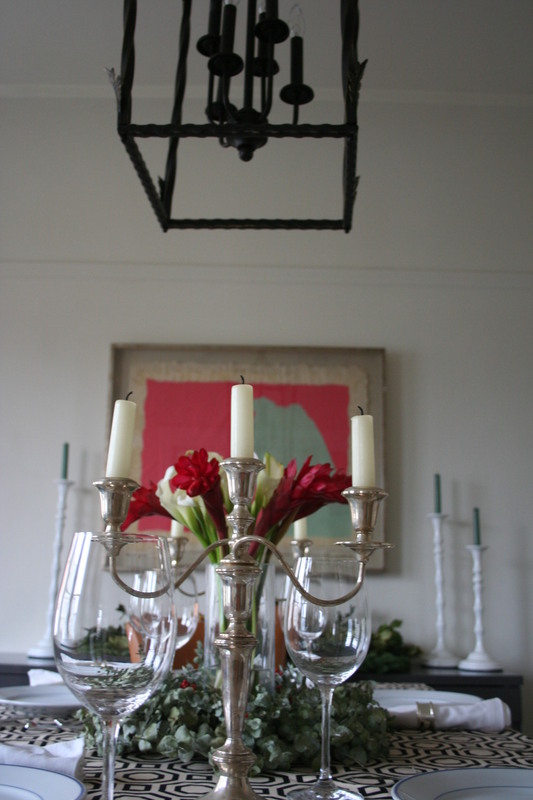 The gorgeous silver candelabra were a generous wedding gift as was the beautiful copper champagne bucket.